Thomas R. Porter (Sakokwenionkwas, meaning “The One Who Wins”) is the spokesperson and spiritual leader of the Mohawk Community of Kanatsiohareke (Ga na jo ha lay gay) in the Mohawk Valley near Fonda, New York, which he founded in 1993. He is a member of the Bear Clan of the Mohawk Nation at Akwesasne. Also known as the St. Regis Mohawk Reservation, Akwesasne straddles the New York State/Canadian border near Massena, New York. He is married to Alice Joe Porter, who is Choctaw. They have six children. 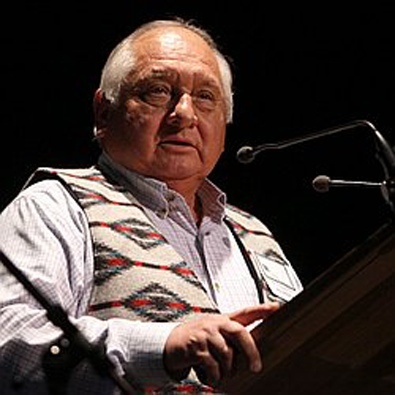 Mr. Porter held the position of sub-chief for the Tehanakarine Chieftainship, one of nine chief titles of the Mohawk Nation, between 1971-1992. Chiefs are considered to be spiritual as well as political leaders, and the duties of that position include officiating at marriage ceremonies, death ceremonies and numerous other traditional ceremonies throughout the year. Mr. Porter was also the director of the Akwesasne Freedom School and a teacher at both the Akwesasne Freedom and the Kahnawake Survival Schools, where he taught Mohawk language, philosophy, history and carpentry. The purpose of both schools is to teach all of the usual subjects,, but within a traditional Mohawk worldview and with an emphasis on keeping the Mohawk language alive and vital. It is said that with the loss of language comes a loss of at least 50% of a people’s culture and identity. Additionally, Mr. Porter worked as secretary for the Mohawk Nation Council of Chiefs for 8 years and as an interpreter for 11 years. He is still called on to help when his schedule allows. He organized the “White Roots of Peace,” a traveling multi-media communications group designed to revitalize Native traditions and beliefs in North America, and was the group’s main speaker, lecturing at various universities and colleges across the United States and Canada. For ten years, Mr. Porter was also the Native American consultant for the New York State Penitentiary System and Chaplain for all of the Native inmates in the New York State Penal System. His office was located in Albany, New York, but he traveled all over the state to meet and confer with Native inmates, as well as to teach and help them conduct traditional ceremonies. The recipient of numerous awards, Mr. Porter has been widely recognized and honored for his work.